Onkyo had the HT-R500 receiver leftover from their HTS650 Home Theater package and gave us the opporturnity to offer them to you! 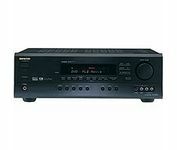 A fantastic deal from Onkyo. Equal Power to All 5 Channels. The receiver is designed to deliver 100 watts of power into 8 ohms with no more than 0.08 % THD to each of its five channels (two front, one center and two surrounds) This will fill even the largest rooms with all levels of sound, from the most subtle to the most dynamic. I've had my system now for three years and for the most part I've been pleased.